This Optima battery is a dual purpose marine battery with 12V voltage power. It has dimensions 12.2 inches by 6.8 inches by 8.7 inches and it weighs around 53 pounds. With Cold cranking amps of 800 A, and marine cranking amps of 1000 A, the Optima Batteries 8027-127 marine battery is has massive cranking power and optimal deep cycle power. This battery from Optima belongs to group 27 and has AGM technology as well as Spiralcell technology like all the other Optima batteries, which enhance the performance of the battery along with many more amazing features that make it one of the best marine batteries. Voltage power of 12 volts and belongs to group 27. Dual purpose applications, offering wide utility options to the user. Cold cranking amps is 800 A and Marine cranking amps is1000 A, which is much higher than the average batteries and it precisely good even in extremely cold weather. Reserve capacity of this battery is 140 minutes with 25 amps discharge at 80° F and capacity of 66 Ah. Plates of the battery are made from high pure lead-tin alloy that has been designed with Spiralcell technology in which the cell is spiral wounded. This battery has capacity of accepting much more recharges, which is three times the amount of any standard lead-acid battery. AGM technology offers maintenance free feature. Completely spill proof and it can be mounted at any position with no damage done to the structure and function of the battery. This battery is vibration and shock proof. Very low internal resistance of 0.0025 ohms and very less self discharge rate, that allows the battery to last for longer period without the need of recharge. Solid cast cell connections for improved vibration resistance. Tightly compressed cell enhances resistance to vibrations. Long service life and good durability. Rugged case construction made of Polypropylene. The Optima Batteries 8027-127 marine battery is applicable for dual purpose applications; it can be used to start any marine engine that demands lesser power than its capacity, compatible with group 27 marine batteries and it can also be used for deep cycle application for running various accessories like fish finder, trolling motor, GPS system and many more high power demanding multiple onboard accessories. 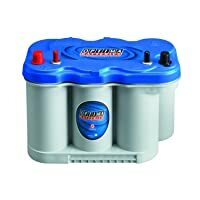 It is a very good low budget choice for those marine enthusiasts who require a 12 voltage dual purpose group 27 marine battery and for those who have room for only one battery. The Spiralcell plate design of this Optima battery makes it a unique battery than other lead-acid batteries in its class. The high purity of the alloy allows the lead to be utilized at its purest form. The Spiralcell technology also enhances the resistance of the battery towards heavy vibrations and makes it 15 times more vibration resistant than other standard batteries in its class. The lower internal resistance of this battery offers faster recharge ability and more power output capability. With three times more deep cycling capability, the Optima Batteries 8027-127 dual purpose marine battery is one of the best marine batteries that have both cranking and deep cycling power. With this battery you can save a lot of time as well as lifetime expense. Due to the AGM technology there is no need of much maintenance and no distilled water refilling is required as this battery has a recombinant technology within it. The solid cast cell connections increase the durability of the battery and ensure maximum plate height for optimal performance. This battery has also much lighter weight than other AGM batteries of the same group. As it is a dual purpose battery, it might not be as powerful as the true cranking batteries; this can create some problems when this battery is used to crank the engines which need the power of true starting batteries. This battery is recommended for cranking the engine with less power requirement than the actual cranking capacity of this battery. One must be very careful while charging and not even accidentally overcharge the battery. This battery is the best group 27 dual purpose marine battery and it is guaranteed to fulfill the necessary power demands up to its parameters. Whether you are a professional or hobbyist, this battery is sure to suit your dual purpose needs.